Dance Commentary by Heather Desaulniers: "Eonnagata"
Sylvie Guillem, Robert Lepage and Russell Maliphant's “Eonnagata” is a stunning physical and visual journey exploring the land of extremes. Presented by Cal Performances at Zellerbach Hall, the piece settles on the 'in between' space where opposing forces pull. Here is an examination of the undefinable and a navigation through the unknown. “Eonnagata” does not provide answers to the paradox of the ambiguous, rather, it calls for recognition, acceptance and celebration of uncertainty. “Eonnagata's” structural foundation is a retelling of the life of eighteenth century French aristocrat Chevalier d'Éon. Appropriately, Guillem, Lepage and Maliphant chose an individual whose existence was filled with indeterminateness, with the specific manifestation being his gender. The historic account unfolded over the 1 hour, 40 minute piece and though very entertaining (sometimes dramatic, sometimes comical, sometimes tragic), it was really just fodder for Guillem, Lepage and Maliphant's artistic thesis; a chronology to underscore their exploration of personal duality. Some particular moments deserve special mention as they really spoke to the avoidance of description and definition. One of the first scenes found Guillem, Lepage and Maliphant dressed in matching androgynous costumes, working with three tables (one for each of them). While polyphonic music played in the background, the choreography had them sliding across the surfaces and intermixing in and with each other's space. This referred to impermanence; a lack of commitment to one spatial location or state of being. Towards the end of the work, these tables reappeared, now with a mirrored top, again encapsulating the idea of individual complexity. Guillem and Maliphant stood on opposite sides of one table, imitating each other's movements while one of them was also reflected in the mirror. The sum of multiple facets is a deep, rich and intricate character. in the United States exclusive premiere of "Eonnagata"
While the conceptual narrative was clever and compelling, the real success of “Eonnagata” lies in its interdisciplinary approach. Guillem, Lepage and Maliphant used numerous theatrical elements though only one entity truly defined the piece. Dance was their constant and everything else (text, lighting, video projection, masks, costuming, sets, stage combat and scene work) informed the movement. 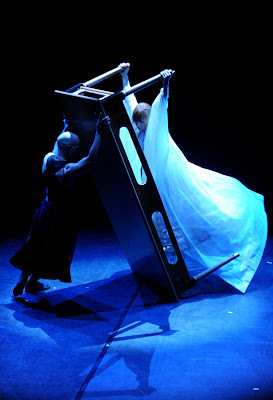 This made “Eonnagata” structurally sound - dance theater at its best. The discussion of “Eonnagata” cannot be complete without the acknowledgment of Sylvie Guillem's transcendent performance skills. A superior technician, her developpé à la second is matchless – an incredible extension that seems to come from nowhere, yet every transitional moment is given full attention. And, I couldn't take my eyes off of her feet; even when she was walking very simply, each articulation was exquisite. But even more than that, her presence was enchanting, graceful and genuine. On Thursday night, she had to re-start her opening monologue, and as she jokingly explained her error, she won everyone's hearts.